The Lefty Card Reveal featured here is from my Daily Moon Vibes post for the Moon in Libra Dec. 28 - Dec. 30. Affirmation: I stand up for me, not neg-a-tiv-ity. I choose truth. 1. Am I telling any lies right now? 2. Who could be telling me lies? 3. What lies are festering inside me that need to come out? If you feel a black ball of tangled negative energy within it could be a lie; a lie told to you by society, your family, a friend. Shine the light of truth upon this black ball to help bring the lie to the surface and root it out. This lie is NOT you. It is a thought form that has grown within you and gained strength. It needs to be faced before you can move on. Lies are sneaky beasts and need watching so that they do not snowball and cause greater mischief and irreparable harm. Forgiveness of self and others along with the making of reparations is important so that when you do move on it’s with a clean and clear conscience. In my own life I have seen this black ball buried deep within a client during a soul reading. I gently, so gently, was guided to tell her what I sensed. We didn’t confront things head on because often crab-like sideways motion is necessary in the beginning so that the lies can be observed and dealt with from different angles. I also channeled some healing techniques and tools to provide her with practical ways to help her help herself. In my own life I put my heart on the line in every painting and soul reading I do. My work is all about heart. It can be a risky road, but I have faith in myself and my work and I carry on, no matter what. The work sustains me as much as it does those who receive it. What a blessing! 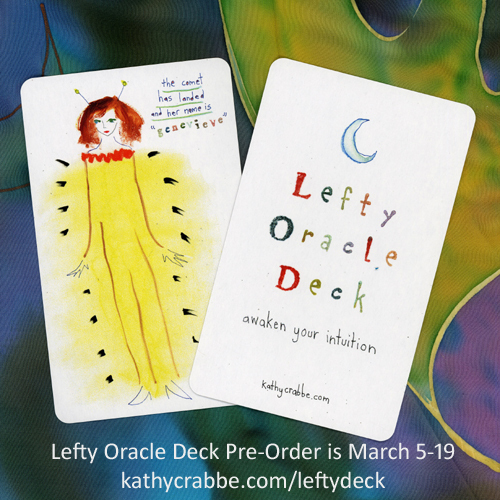 The Lefty Oracle Deck and 92 page Guidebook will help you break through creative blocks, identify your gifts and empower your intuition so you can move forward in a playful and profoundly life changing way. Click here to learn more.